Individuals who are visually impaired are unable to read without assistance - some people need larger font or an audio book; others read in a special raised print known as braille. Although silicone wristbands became trendy many years ago, it was hard for visually impaired people to enjoy the customized messages until Amazing Wristbands was challenged by a customer to create a wristband with a message in braille. Since then, the company has created numerous other braille messages on their wristbands, always taking care to get the particular message just right. Because of the unique nature of the messages on braille wristbands, they are perfect for charities that provide help to the visually impaired. They can be used at fundraising events, or they can be giveaways to get the word out. The messages will be crafted in perfect braille so those who read the raised dots can interpret the meaning for those who don’t, heightening the awareness of issues that the visually impaired community faces. Braille is a pattern of raised dots - essentially a code that forms words to be read by fingertip by blind or visually impaired people. It was invented by Louis Braille in 1809 and is used by thousands of people around the world. According to the National Federation of the Blind, there are over 7 million people in the United States who are blind. Using braille wristbands to raise awareness can help those people. 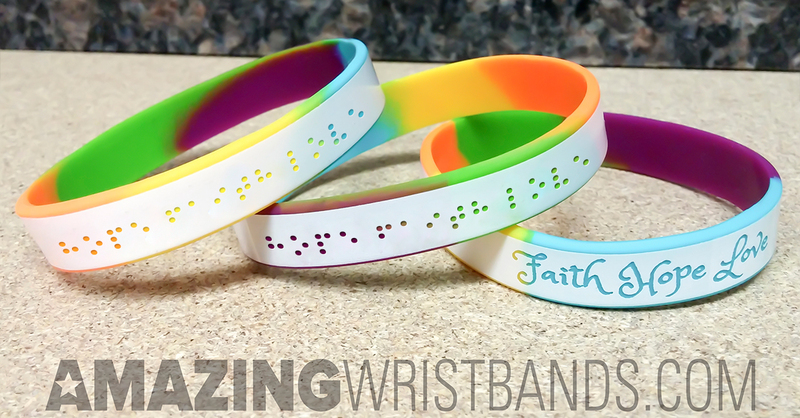 Why Buy Braille Wristbands from Amazing Wristbands? 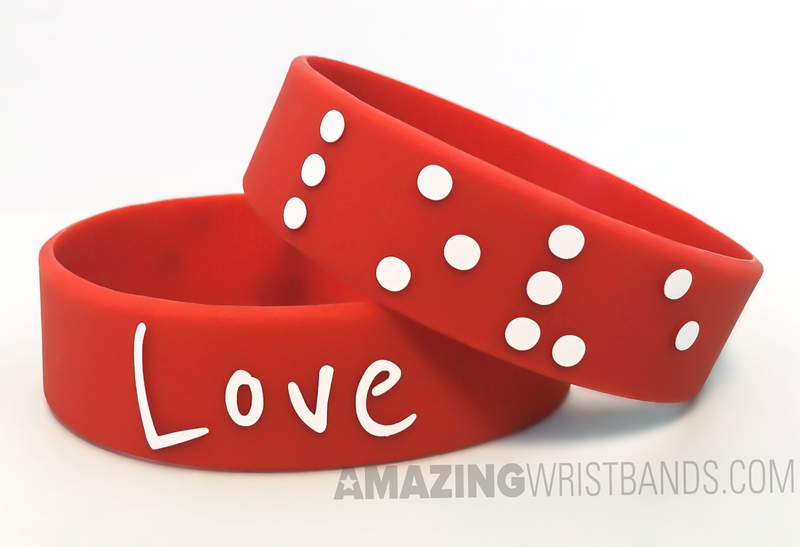 Amazing Wristbands is a leading provider of customized silicone bracelets available online, including braille bracelets. Our wristbands are comfortable, durable, and non-allergenic, made of 100% silicone. Many of our wristbands can be created with our easy-to-use online tool. In addition to standard wristbands, We also offers super popular slap bands that “snap” to a person’s wrist, as well as half-inch bands, thicker one-inch bands, adjustable bands, USB bands, silicone rings and silicone key chains. Braille bracelet with Magisterium brailled on them.